Ferrari is doing an expert job of squandering their preseason advantage while Mercedes-Benz develops past them. Bit of a farce from Verstappen there. CH was telling him "you need to go NOW" and he was just letting everybody by. Didn't complain about the car, just saying he was "trying to be nice' and ended up missing the cut-off. Bit odd! The margins between the two Mercedes, Ferrari, Renault and Williams all very small. Renault just 0.004 seconds. The result of this race is not very predictable though. Congrats Bottas, hope he finishes the job tomorrow! I expect another Merc 1 / 2 tomorrow is the favoured result. Only three races in and I think I'll knock this season on the head. Roll on 2021.
they just showed Bottas' qualifying lap here. Pretty much inch perfect and barely any steering movement. Looked like he was on rails. That should do wonders for his self-confidence! Was a cracking lap. If Mercedes are going to run and hide again this year I hope Bottas can keep this up and run Hamilton hard. Really surprised to see Ferrari so far off... wonder if theyve had to turn the engines down a bit again.... Kimi seemed to have an issue in Q2 as well, on top of Giovanazzi's woes. Strange one. Mercedes are a touch faster than their qualifying times from last year. Ferrari are about 0.8 down on what they did last year? Bottas again ahead of Lewis, as they were last year but, Lewis has halved the gap. in two weeks? Out developed in two weeks. Bottas' lap wasn't that great. He didn't nail it in Q3 which shows the advantage he had here, as he was still able to claim pole anyway. In terms of the weekend running, Bottas has been impressive so far, even though he can't be entirely happy with his Q3 showing. I’ve never seen team mates so close, nearly every pairing is within 0.030 which is crazy. It makes Gasly’s gap look even more terrible. Gasly is getting absolutely smashed and Max has been on it as much as can be reasonably expected to open 2019. The combination is very ugly for Gasly! I wonder how much the car has to do with where you end up on the grid? Bottas does seem to be good at figuring out how to get the best out of a new car at the start of a season. The top ten is a bit Noah's Ark. Apart from Red Bull all the pairings are pretty close to each other, too. Does look like the car is the star here in qualifying at least. Wonder what happened to McLaren? Half a second down on the Renaults when they were neck and neck last weekend. As a general point, how can everyone who follows F1, pundits, tech guys, computer guys, commentators get the top order between Ferrari and Mercedes so wrong? Were Mercedes super clever at hiding their speed? Kvyat is far closer to Gasly than Gasly is to Verstappen. In Q2 and if you compare Kvyat's Q2 to Gasly's Q3. I honestly do think Kvyat would have had a better start against verstappn than Gasly has. And out of the top 3 teams, I certainly wouldn't say Bottas is the weakest out of them all as some thought may be the case. I don't think that will even turn out to be the case. I just can't see Gasly turning out better than Kvyat, but I guess it is early. Cue payback in the race perhaps? 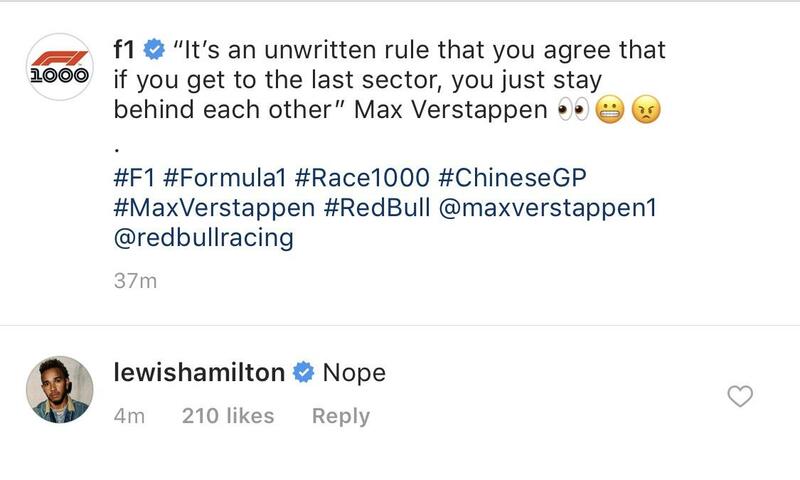 I do think that Max doesn't trust the people around him and thinks he is the only one who can make decisions. His engineer will have a better view of those on track and perhaps he will have learnt that by missing out on a run. Needs to be a team player to win the WDC, he also might need to help Gasly get closer, he might need him in the overal scheme of things. Didn't expect Mercedes to be quicker in qualifying here after the advantage Ferrari had in Bahrain qualifying. Wonder whats changed so much to see an 8/10ths swing - possibly Ferrari power unit issues again? Ricciardo outqualifies Hulkenberg, could be a turning point for him as he gets to grips with the new card. Also a big LOL at Verstappen the whining idiot. I think Ferrari are running their engine less hard after the Leclerc problem in Bahrain. With 18 races after this one, they can't afford a failure, as it will mean doing 9 races per engine on the replacements, or taking gid penalties, not to mention the fact that they are unlikely to be far enough in their development schedule to introduce the next generation of powerplant - so any replacements now would have the same issue as the current one. It is far safer for the rest of the season to be running at a reduced pace now and follow Mercedes home than jeopardise their entire season. How do you know if it was not a delayed message on the replay? Maybe that was said after they all passed him. He was trying to make space. The Renault may have been happy with the gap to Vettel because Vettel was always going to pull away from them. Anyway it's pointless to augue about because it is an not a rule, so nobody should complain in upcoming races. They all left it too late. If those drivers had sat behind Max then they wouldn't have crossed the line in time to get their fast lap in. If the positions had been reversed, he'd have done the same thing. A typically childish response from him though. “But whatever. From now on in qualifying I'm going to f**k them up as well. Thanks for that, so basically its fast but fragile, I guess they will take more risks when that PU approaches the end of its life. Petulant boy-child!!! Remember last year, in the race, Max punted Seb in an over the top dive bomb with both drivers spinning. Max earned himself a 10 second penalty for the incident. Max starts directly behind Sebastian tomorrow. Things could get very interesting very quickly. Wasn't there an unwritten rule a few years ago that he wasn't keen on following? Quote from Vettel. Four-time world champion Sebastian Vettel, a director of the Grand Prix Drivers' Association, said: "It is very simple. The day I joined F1 it was clear and it was a sort of unwritten law, and in recent times we have had situations and got away with it. Ferrari really need to sort that out for their next upgrade or it's going to cost them quite a bit over the season. 0.250s is probably about the margin Hamilton has over Bottas anyway. I think those sector times show that Hamilton failed to put together a good lap whereas Bottas succeeded. Well he was a fair bit closer in the end the last 2 qualifying sessons. And the last 2 of last year for that matter. Given Hamilton wasn't great here last year, I'm not sure 0.250 difference is actually what it would be. 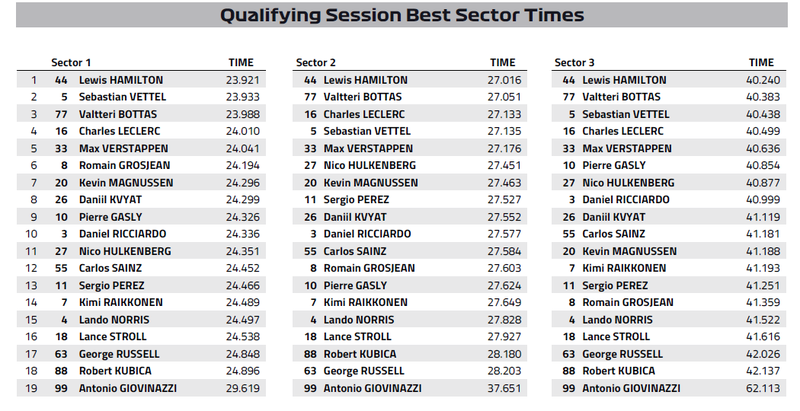 The times have come from the other sessions too which don't really represent Q3 do they? 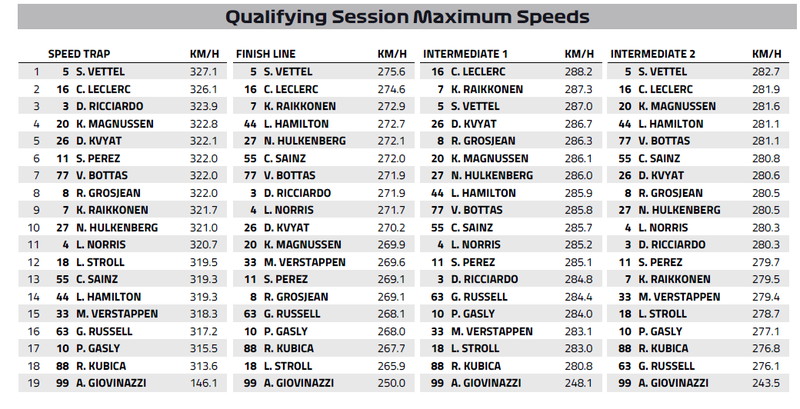 I remember several qualifying sessions last year or before that not everyone was quicker than their Q2 time in Q3. Bottas has consistently looked comfortable this weekend. Hamilton has had slightly more speed, but not always at the right times and not that often either. If you meant that as an average gap over most race weekend qualifying, then I think I agree that is about right.